Patrick Honohan said many firms may need restructuring to survive and avoid imminent loan defaults. IRISH CENTRAL BANK Governor, Patrick Honohan, has called for an increased focus on corporate restructuring which he says will reinvigorate our economy. Speaking at the Corporate Restructuring Summit at the Convention Centre Dublin yesterday, Honohan said “that given the large numbers of firms still under pressure, the implementation of an effective and speedy but surgical approach to corporate restructuring could have a big impact”. 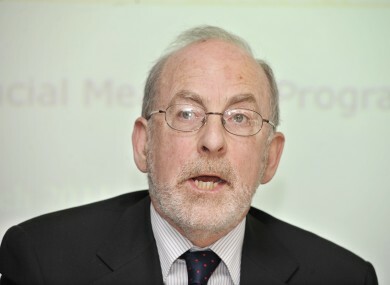 Honohan drew attention to the number of firms counted by the Central Statistics Office (CSO) in the census of Industrial Enterprises, which fell from about 5600 to under 4800 between 2008 and 2010 – “the worst period of the crisis and the latest for which data is available”. Honohan said that “despite a big shakeout, many of the remaining firms are in a weakened financial condition, and may need balance sheet as well as organisational restructuring in order to survive”, as many head towards loan defaults. “But the research also indicates that some well-run firms can ride these problems out, notably if they are being run by an experienced owner that has been with the firm through other ups and downs,” he said. The Central Bank Governor said when restructuring works well, the assets of the failing firm, along with the human capital embodied in its staff, will find a good alternative use. Honohan said the role of the banks in restructuring will be key as their specific company knowledge could help in maximising the value of a firm’s assets. “The banks in turn need to be provided with sufficient capital to allow them to fearlessly accept and crystallise the unavoidable loan-losses, sufficient liquidity to be able to provide further financing to set the restructured firm back onto a healthy growth path, and eventually move it out of the limbo of financial distress,” he said. Honohan said restructuring would ultimately help boost economy-wide employment. “Requiring unusual and scarce skills and judgement, this is a task which urgently deserves heightened attention,” he said. Email “Central Bank Governor calls for focus on corporate restructuring”. Feedback on “Central Bank Governor calls for focus on corporate restructuring”.